Unlike patios, decks, or walkways, trees can't be installed in a few days. While outsiders might imagine the Alamo City as a sparsely vegetated desert, for many homeowners in San Antonio, tree service is an important part of normal property upkeep. Of course, many Texans opt to perform their own tree service; San Antonio is smack-dab in the middle of the type of environment, however, where a few relatively small mistakes can have a very significant effect on your trees. Though the near-Midwestern climate of Dallas or the wet, humid weather of Huston might be a little forgiving when it comes to do-it-yourself tree trimming, San Antonio's sweltering summers make this task a rather delicate one. It may not have the high-powered feel of tree removal or the botany-class feel of tree treatments, but simple and effective tree trimming is by far the most common form of tree service. San Antonio homeowners who don't frequently have their trees trimmed are often pleasantly shocked by the effects of tree trimming like better health and new growth (and in some cases, free firewood or mulch). Trees can show new growth in just a few days. It may look like professional tree trimmers are taking off a bunch of foliage, but like a haircut, it'll grow back before you know it. Of course, you can attempt to take on your own tree trimming, but the expertise and convenience of San Antonio tree service contractors is formidable, particularly if your upper tree limbs are beyond your reach. While successful DIY San Antonio tree service is possible with a bit of research and patience, homeowners should not attempt full tree removal on their own. Chainsaws and a strong push or a pickup truck may or may not succeed in taking the tree down, but without the proper equipment there's no way to predictably control which way a tree will fall. 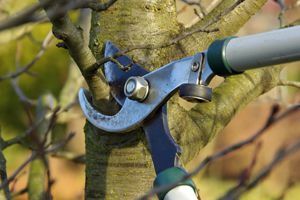 Tree felling is a notoriously inexact procedure, and even professionals can probably tell you a story or two in which a tree seemingly had a mind of its own. In fact, if your tree is anywhere near an existing structure, your San Antonio tree service contractor will probably take what seems like unnecessary precautions. Plus, liability insurance is a must for any serious tree removal contractor. Even if the nuts-and-bolts weren't beyond most everyone's expertise, the city of San Antonio may very well demand you get a permit before your tree is removed. The city has recently relaxed some of the specifics of its tree ordinance, but this doesn't mean you won't need to get a permit for your tree, depending on size and species. Contractors are experienced and deft at obtaining these permits. Prompt response for any area of home improvement almost always leads to better service and lower costs for your project. While it may seem like your tree has all the time in the world, this truism applies to tree service as much as anywhere else in your home or yard. Tree trimming keeps your tree healthy, reducing the chances that it will suffer disease and other harm that may require expensive treatments or removal. If your tree is diseased beyond hope, waiting until the tree has finally kicked the bucket to have it removed may cost three times as much. Diagnosing disease, fungus, and insect infestation early is one of the most beneficial aspects of performing regular tree service. San Antonio is home to many different kinds of insects, fungi, and tree ailments that are simply too subtle for the average homeowner to spot in the early stages, and often by the time you notice a problem, it has already had a chance to take hold. This leaves you with few options, and in the worst cases will have you removing a tree that has been an asset to the property for generations. By performing a check-up once a year or every other year, San Antonio tree service companies are able to diagnose problems well before they become severe, allowing you to keep your trees for a relatively low price. As part of our service to homeowners, HomeAdvisor tracks all the home improvement projects we process including tree service in San Antonio. This allows us to tell you how much projects have been costing in your neck of the woods. Unfortunately, the cost of tree service is impossible to predict or estimate. Many homeowners find their projects cost several hundred dollars, but basic service may cost as little as $100 to $200. One of the reasons the cost can vary so much is that many San Antonio tree service companies offer a wide array of services. One San Antonio homeowner spent $1,200 to "beautify his property" and told us it was money well-spent. The best advice for project costs is to get multiple bids, of course, but make sure you're comparing the same services. One company may offer a considerably cheaper price to remove your tree because they're not offering to remove the stump for you. Comment: 3 1/2 foot width tree fell onto fence from my backyard and onto their shed. Need the tree cut and removed. Comment: I would like to get an estimate for tree trimming. Comment: RECENTLY TRIMMED LARGE TREE IN FRONT YARD. HAVE SMALL, MEDIUM AND 2 LARGE BRANCES TO MOVE . 1 PICK UP LOAD AND OR TRAILER SHOULD DO IT. Comment: I had storm damage and large branch fell on roof. I require tree branches cut down so no additional damage will be done. Specific tree branches are directly over house roof. Comment: Need to have trees raised and underbrush on the trees cleaned up. San Antonio Tree Services are rated 4.78 out of 5 based on 2,527 reviews of 96 pros. Not Looking for Tree Service Contractors in San Antonio, TX?